Ancestry.com continues to be my go-to record provider because I can often fill out a family just by searching for one of the family members. The green leaf Hints are great, and often lead to more records through the Suggested Records feature, and I use them all the time. However, when I encounter an 18th or 19th century person in my RootsMagic database without a birth or death date, I do a search for them using what I already know in the search fields, and then follow the Suggested Records to add as much content and as many sources as possible. Note that there are links for each of the family members - if you click on one of them, you will see their summary information also. * U.S. Federal Census Mortality Schedules, 1850-1885 for Samuel M. Prentiss. This is for a Samuel Prentiss who died in December 1879 in Cleveland, Ohio. 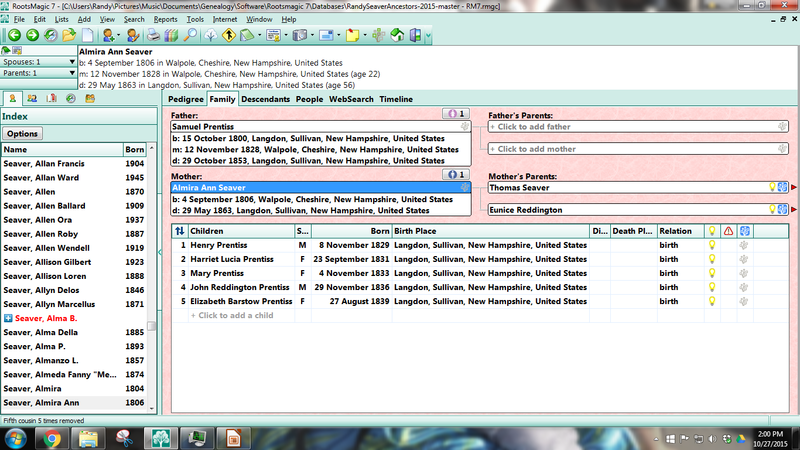 * 1850 U.S.Federal Census for Saml M. Prentiss, born in 1801 in NH, residing in Lorain, Ohio. * U.S. Federal Census Mortality Schedules, 1850-1885 for Saml M. Prentiss. This is for the same Samuel as the two above, who died Dec 1879 in Chester, Michigan. Strange! * 1870 U.S. Federal Census for S. B. Prentis, born in about 1801 in Vermont, residing in Cleveland, Ohio. This Samuel is different from the one above. * 1860 U.S. Federal Census for Samuel Prentiss, born in about 1801 in Maine, residing in Valle, Missouri. This is probably a different Samuel than the two above. * New Hampshire, Death and Burial Index, 1654-1949 record for Samuel Prentiss, which has the same information as the screen above. * 1850 U.S. Federal Census for Samuel Prentiss, born about 1801 in New Hampshire, residing in Langdon, New Hampshire with wife Almira and five children. This is a duplicate of the 1850 census that I found at the beginning. I don't know why Ancestry provides duplicate records but they do. * 4 of the Suggested Records apply to the Samuel Prentiss in my database - a birth record, two death records, and a duplicate 1850 census record. 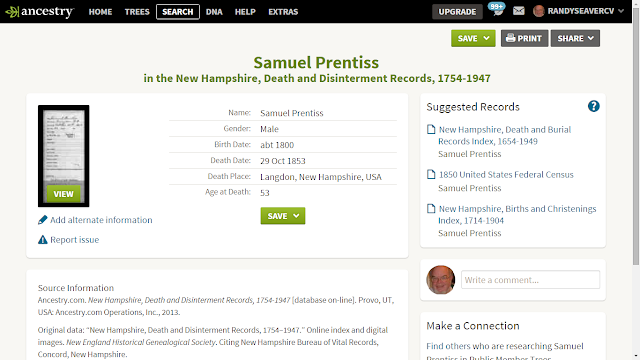 * 5 of the Suggested Records did not apply to the Samuel Prentiss in my database - they were for three other men named Samuel Prentiss. However, each of the Suggested Records that were not the right person matched the search terms fairly well (differing only in the birth state). I added the birth and death information, and the 1850 U.S. Census information, for Samuel Prentiss, along with source citations for the records. * 1860 U.S. Federal Census for Almira A. Prentice, age 52 residing in Langdon, New Hampahire. This record is for my database person. * New Hampshire, Death and Burial Records Index, 1654-1949 for Almira Prentiss, who died 29 May 1863 in Langdon, New Hampshire. This is for my database person. * 1880 U.S. Federal Census for Almira Seaver, born about 1806 in Vermont, residing in Antwerp, New York. This is not my database person. * New Hampshire, Marriage Records Index, 1637-1947. 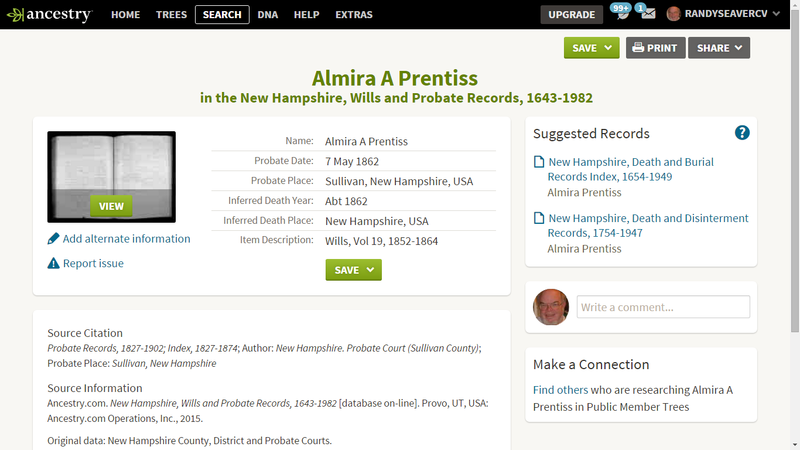 This record provides the marriage date (12 November 1828) and location (Walpole, New Hampshire) for Almira A. Seaver and Samuel Prentiss. 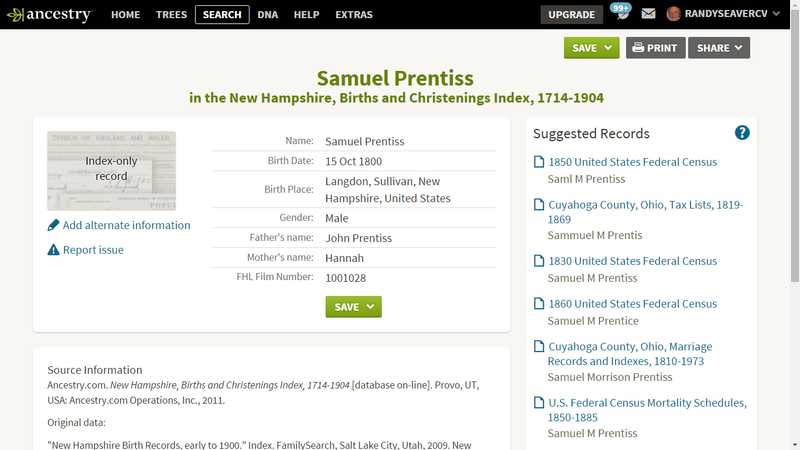 I wonder why the record didn't come up on the list of Suggested Records for Samuel Prentiss. 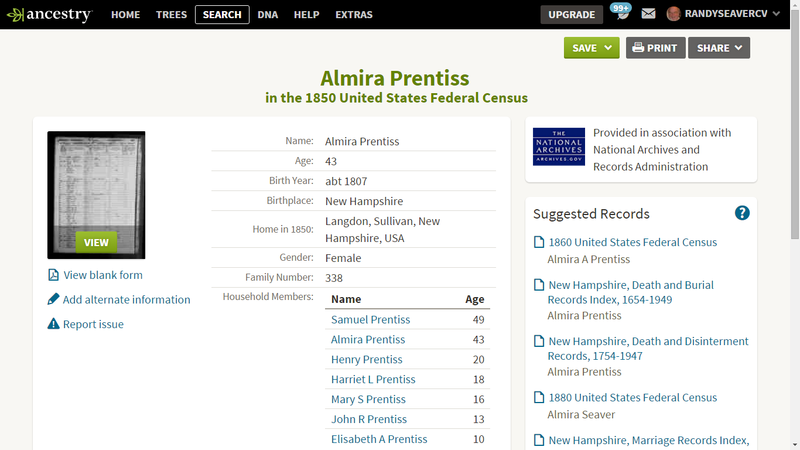 * 1850 U.S. Federal Census record for Almira Prentiss, born about 1807 in New Hampashire. This is a duplicate record. * 5 of the 6 records apply to Almira (Seaver) Prentiss in my database. * 1 of the records were for another Almira Prentiss with a different birth state. I think that this probate record is for my database person, Almira A. (Seaver) Prentiss in Sullivan County, New Hampshire. I looked at the record itself, and her will was dated 7 May 1862. I added the death record, the two census records and the probate record to my RootsMagic database with source citations for each. For both of these persons, this process took less than 30 minutes to find, evaluate, add event data and craft source citations. It did take longer than that to write this up. Much better! Except now I need to work on the five children to find death records and marriage records, and information about the spouses. I don't usually add a second generation of children for Seaver females, although I could in the future. I could attach these records to these persons in my Ancestry Member Tree if I desired - I don't because I will replace my Ancestry Member Tree at some time in the future (I use my RootsMagic database as my master family tree). I could add this information to these persons in the FamilySearch Family Tree also, along with the notes and sources. I have thousands of persons like this in my database for whom I need to enhance their profile - a missing birth, marriage or death date, and additional records like draft registrations, census, military, probate, land, etc. records. Eventually, my database should be nearly perfect (yeah, I saw you roll your eyes there!). While they aren't always for the correct historical person, they often are and I find them very useful. It's easier and faster to use them than to work through the list of hundreds of Records on the search results list. Granted these are the low hanging fruit, but it's fruit that I have now picked and my database is better off for it. How do you handle the Ancestry Suggested Records? Pretty much the same way you do Randy. I look at the records offered and make an educated decision as to whether they pertain to my ancestor. Sometimes that involves looking at several of the records suggested to get a better picture. I do love those New Hampshire records. My husband has lots of Hall ancestors from NH. I agree with you that the hints offered by Ancestry do help me with my research. Not the family tree hunts (although every now and then they help too), but the actual record hints. The "Suggested Records" are at least mostly what others have attached to persons in their trees, being persons that the Ancestry search algorithm "thinks" are the same person for whom you are viewing a regular Ancestry hint. Since both tree owners and the Ancestry algorithm are often wrong about identities, if one does not have the particular record item for their own target person, it is sometimes but not always worthwhile to look at the "suggestion" and thoroughly evaluate its applicability. The algorithm sometimes lists items (such as Census enumerations) for women under maiden names, when they are already married by the date of the record; this is one of the most frequent errors I have found listed in "Suggested Records". Randy I would suggest you accept the Ancestry hints that you know are for the person you are researching even though you may upload another version of your family tree later. I have found it helps improve the search results for yourself and others. I use Roots Magic as my primary database, but when I am researching people in a family I use Ancestry.com and My Heritage to do the preliminary research for me. I fill in the information I have and accept the hints I know are correct. In some cases new hints come up instantly, in others when I come back to that person new hints are provided. 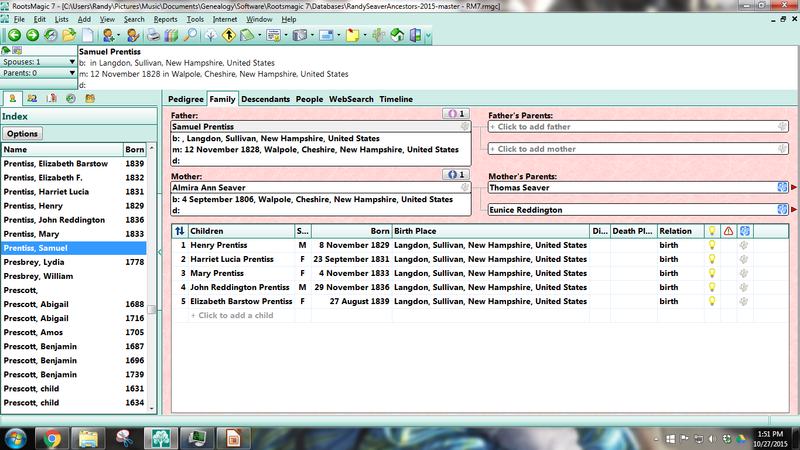 I also do the same thing for Family Search Family Tree. It seems the more records that are attached to a given person the better the search engines work. Thus all three services are busy at work doing the preliminary research for me. I can then focus on the harder to find records and my narratives. If in doubt I don't attach. I don't usually attach other family trees and a couple of the databases that contain information from old family trees that is unsourced. I just hit the ignore button. I do use other Family Trees for clues and pictures.